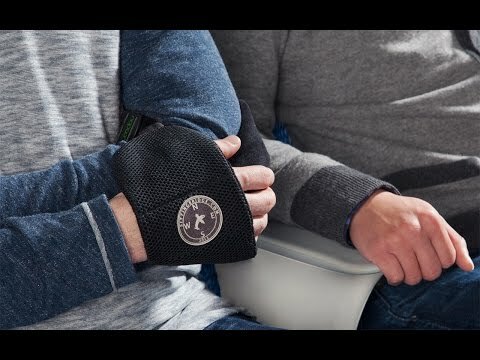 The NAPWRAP is a travel accessory that supports your arms and removes the need to fight over the armrest. It helps you rest comfortably during long flights, train rides, or bus trips. It’s also convenient for other travel functions. Use it as a sleep mask, or to keep your ears warm, and even to carry your smartphone when you take a jog. “ A highly practical innovation ever created! this did assist me in keeping my arms comfortable in a center seat. Brilliant idea. Love the innovative ideas that The Grommet comes up with. This NapWrap fulfills a need and I enjoy using it. Rest comfortably on a plane, train, or bus with NAPWRAP, a cushy sling that’s like a personal armrest. If NAPWRAP looks confusing at first, you’re not alone. It takes a few seconds to figure out. But once you experience its snug, oddly comfortable support, you’ll feel the brilliance behind this simple solution. Founders Bruce Backer and Mona Dehshid are designers and frequent fliers. After suffering a lack of shut eye in transit, they figured out why sleeping while sitting up is so tough—arms need a place to rest. After testing 100+ designs, they came up with NAPWRAP. Slip it around an arm to create a cradle that holds your arms in place. 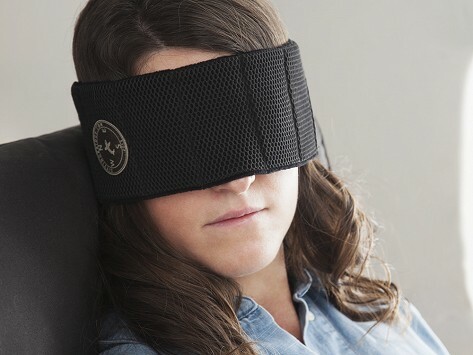 Turns out this little wonder has multiple travel functions, so use it as an eye mask, an ear warmer, or as an armband that holds your smartphone. Super soft, lightweight, and portable, NAPWRAP is made to take anywhere. Curl it around your suitcase or duffel bag handle and be prepared for some supportive rest.